A few apps have been updated to take advantage of the iPad2. Most are around the camera, and a few for the screen and speed of the new device. Since the actual screen size is the same, we aren’t seeing anything needing to be changed by developers to re-flow their apps like moving from an iPhone to an iPad. While some apps we have been using on the iPad work just fine as they are, the addition of a camera and tuning of the apps to use the camera is getting us thinking about other ways of integrating the iPad2 into our daily workflow. 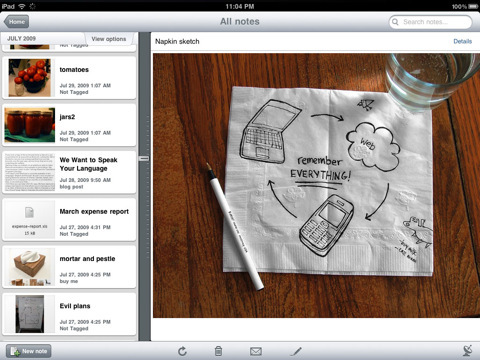 Evernote: The Evernote app is one of the first things back on our iPad2. It keeps all of our typed notes, tagged, synced through the cloud to our other devices and everything is searchable. Now, we can take pictures of documents handed out in a meeting and place them in their own note or in a note that references them. Full disclosure, we all have the Premium Service that allows the text in the image to be found via a search in Evernote. An added reason to take pictures of paper documents beyond the saving of a tree. 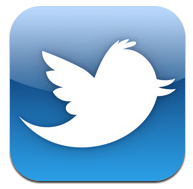 Twitter and Twittelator: Both the Twitter app for the iPad and Twittelator for iPad have been updated to allow the addition of pictures and videos captured with the iPad2 camera. While mostly for fun, we could see that this could be handy for conferences, sharing a quick bit of location information to the folks not on site. Word Lens: The Word Lens app is one of those fun tools that becomes a life saver when you least expect it. 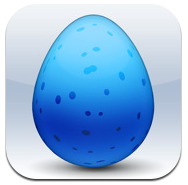 The app has been updated to be a universal app and is much more usable on the larger iPad screen. Simply aim your iPad2 camera at a sign and the language will go from Spanish to English or reverse that in real time ‘on’ the sign. 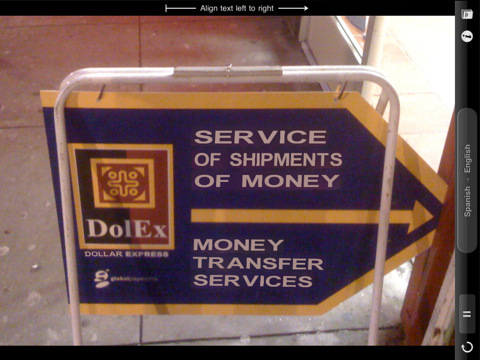 Word Lens also offers typed word translation. While to language selection is limited to Spanish/English right now, we love the fact that no Internet connection is needed! PostCard: These are not the postcards we have mentioned in the past where you create and then pay a service to print and mail. 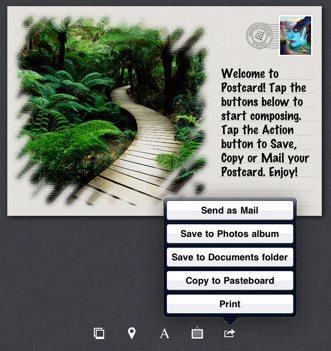 PostCard for iPad is the ‘electronic’ counterpart. You can use and image on the card and the same or different on the stamp, add your text and email to family, friends and clients. The update allows the use of the iPad2 camera. Most of us chuckled as another app encourages us to take our group photos with our iPads, but then one team member took a picture of a document for general layout thoughts, added his suggestions and ‘sent’ the postcard. The client emailed right back so there might be something to being able to turn a image into something interesting and doing it quickly all through the iPad2. Things: An app that was updated, without mentions of the camera. The newest version of Things for the iPad has brought us Repeating Tasks. We have enjoyed this feature on the desktop version of the enhanced ToDo manager. 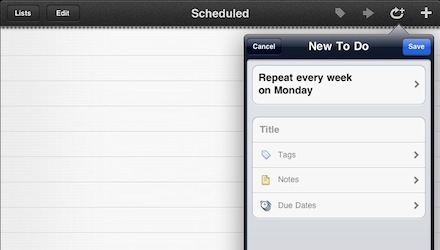 Now, we are able to set up the repeating tasks and manage those synced from the desktop. Repeating Tasks are one of those ToDo types that make more sense to be on a ToDo list than a place holder on your Calendar.